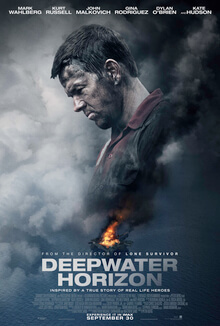 After getting through the hackneyed “man leaves wife and daughter to go to the sea” introduction, made more unpleasant by the spunky, Nickelodeonesque cutie pie daughter of oil rig safety engineer Mark Wahlberg and wife Kate Hudson, Peter Berg’s (Friday Night Lights, Lone Survivor, Patriot’s Day) disaster flick settles down nicely. The pace is taut, the action gripping, the explanation of foreign concepts effective, and the clash of personalities (true blue safety guys Wahlberg and Kurt Russell versus corporate, dollar-watching rig manager John Malkovich) not too heavy-handed. A decent expenditure of time, but as my daughter remarked, probably better delivered as a documentary. The movie hewed pretty close to the facts, but, incredibly, left one off that perhaps seemed to incredible to portray: college kids were fishing under the rig when it blew up.